A treat for chocolate lovers: this Thorntons hamper is a complete stack of all 19 of Thorntons favourite chocolate blocks. This luxury hampers includes some of the old favourites like dark, white, milk, orange, mint and 85% chocolate but also has some unusual flavours like balsamic chocolate, chilli chocolate and orange and cardamom chocolate. 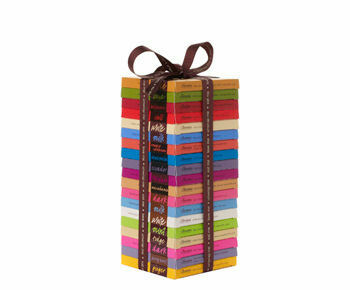 Also included in this hamper are bars of fair-trade chocolate in milk, dark and white chocolate. Perfect as a Christmas, Valentines or Mother’s day treat for Family, friends and loved ones.